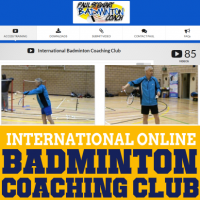 Due to the number of emails I receive on badminton restringing, I decided it was the right time to launch a dedicated page to this subject, which will also include racket customisation. 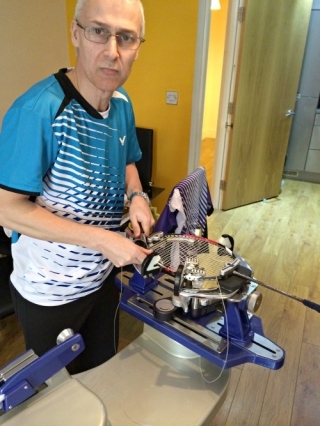 I began restringing rackets around 1987 and have had the privilege to string badminton rackets for players of all standards including World and All England Champions. I cuurently Head up the Victor stringing team for the All Englands and more recently was the official Victor stringer at the World Championships in Glasgow. There are so many points of view regarding string tension and string selection. Choosing both are as personal as choosing a racket. Hopefully you will find lots of information on here to help you make better choices in the future and therefore get more from your racket. In the UK most rackets arrive pre-strung, depending on the manufacturer and the price of the racket. This may be beneficial for a beginner of inexperienced intermediate level player, however there is always a point with any player that they begin asking questions about string types and tension because they wish to improve and consider a restring may help them. Hopefully I will answer most of the questions if you are such a player. What Is The Best String Tension For My Badminton Racket? Due to the large international audience Badminton-Coach reaches, it is important to recognise the different badminton cultures that exist. Therefore, the string tensions I recommend for the UK market will differ from those used in Asia and vice versa. Note: I am aware that in Asia these guidelines will be considered too low. I hear beginners are recommended starting tensions of 24lbs by coaches or stringers. I respect that although do not agree. It is readily accepted that lower string tension provides a larger sweet spot on the string bed. The sweet spot is simply that part of the string bed where the strings work best to provide the most effective result for the player. At lower tensions the larger sweet spot allows the string to absorb and repel the shuttle better. Lower string tension tends to provide greater power but less control. The string bed is too springy for control purposes. As tension increases the sweet spot reduces. Better players make less hitting errors and therefore require a smaller sweet spot. Their consistency in hitting the shuttle on the sweet spot will also mean their requirements are different. A smaller sweet spot, due to higher string tension provides a different feel for the better player. Their technique is usually better which allows them to hit the shuttle harder. They generally require greater control from their string. By reducing the trampoline effect of the string, the better player is able to play the shot more accurately and with greater feel. As their string tension requirements continue to rise, their control may improve but they will sacrifice some power to gain the control. HIGH STRING TENSION DOES NOT GIVE YOU MORE POWER! I have deliberately made the above statement stand out as there are players around the world that believe it. This is a common misconception. For the record, I have met players whose egos have unfortunately clouded their judgment. The “mine is bigger than yours” syndrome can be extremely damaging and should be avoided at all costs. It’s even more damaging if these players are influencing young players who shouldn’t be having their rackets strung at ridiculous tensions. Some of these players have continued to use excessively high tensions resulting in serious tennis elbow or shoulder injuries. These injuries can be caused by other reasons, which combined with incorrect string tension, bring about a deeper, longer lasting injury. There will always be exceptions to my guidelines. I know of a very good player who mostly plays with plastic shuttles and yet he has tensions in excess of 30lbs in his rackets. It’s a personal choice as I’ve said before but this player tested over a number of years to reach these string tensions. Manufacturers generally provide tension guidelines on their rackets. What do they mean? Simply put, if you decide to have your racket restrung at tensions exceeding the guidelines, then you invalidate the manufacturer’s warranty. If your frame breaks and your string tension exceeds the manufacturer guidelines, do not think that removing the strings and saying your racket was strung at a low tension will help you. Manufacturers will only consider a warranty claim if the racket is still strung. All international players exceed manufacturer guidelines. However, they receive free rackets and obtain free replacements. Most rackets can accept higher string tensions than manufactures warrant, however, if you choose to string at higher tensions then the risk is yours and not your stringers. Nobody can tell you what tension is perfect for you. The only way to know this is to test. Test other players rackets as invariably, one will feel better. There’s your first clue to find what’s right for you. If you are unable to borrow rackets then I suggest you find a stringer who will work with you. Perhaps you can approach them on the basis of doing a series of restrings at a special price. This allows you the opportunity to test different tensions to find the one that feels best, providing you with the right combination of power and control. I recommend you decide on a starting tension and then increase in increments of 1 lb. If you really feel the tension is too soft, then increase by 2lbs for the first restring, but this should be carefully considered. After all, that means an additional 2 lbs tension on every string in your racket. But, doesn’t this mean starting all over again? Generally I find a 1lb difference either way is sufficient and therefore makes the process easy. But, whilst you are choosing and testing different strings, remain with your optimum tension. Naming the most popular badminton strings is difficult because this depends on what your local stringers offers as it is impossible to stock every string. It also depends on where you are in the world as there can be culture influence. In badminton there are basically three types of string, monofilament, multifilament and microfilament. Unlike tennis, badminton players tend to use the same type and gauge of string for the mains as well as the cross strings. A monofilament string is basically a single core with a jacket or sleeve to protect it. The core provides the strength in the string. The choice of materials determines the strings stiffness and resiliency. The core is the source of the string’s power. Monofilaments tend to be stiff badminton strings and are generally used by beginners and intermediate players. The jacket or sleeve coating protects the core. They have different textures on the surface which aid with control. A rougher surface provides more “bite” on the shuttle for spin and greater control. A multifilament string has a different core. This is made from thousands of different thin fibres twisted together. These strings tend to have greater resilience and power. There are also microfilament strings whereby the fibres in the core are even thinner than a multifilament. These strings are not particularly popular in badminton. What Is String Gauge In Badminton? String gauge is simply the thickness of the string. 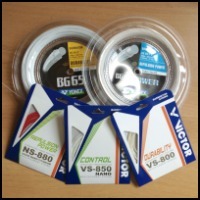 As a rule of thumb, a thicker gauge string will be more durable than a thinner gauge badminton string. However, there is more mass of string and it will therefore it will feel heavier on a frame compared to a thinner gauge badminton string. An example of a thicker gauge string is a 0.75 gauge like Ashaway Flex 21. A thin gauge may feel great and will most likely emit a different sound as you strike the shuttle. The downside is the really thin badminton strings are more likely to break. How often should I have my racket restrung? I have heard stringers quote answers to this such as, “you should have your racket strung as many times in a year as you play in a week.” So, if you play three times per week then have your racket restrung three times a year. I don’t necessarily subscribe to this answer because you may play for 3 hours each day. 9 hours of badminton a week is a lot and therefore you will certainly require more restrings. If you play frequently, then pay attention to your racket. When you feel it’s lost something, maybe that’s the time for your restring. If you look closely at the strings then they may look a bit furry. That’s a definite sign of wear and they won’t have much life left. Alternatively, you may notice that your strings are felling dead. You’re just not getting any power from the strings or your net shots are simply not happening. That’s a good time for a change. All strings stretch. Therefore, if you had a racket strung at say 20 lbs, by the time you play with it I expect tension loss of around 10%. This is sometimes known as string creep. This loss of tension is normal and should be expected from any elasticated fibres. In this example your playing tension may be around 18lbs and the string will continue to lose more tension, but at a diminished rate over time. What causes a string to break? Notching – as the strings move on the string bed, they are effectively cutting grooves into each other. As the grooves run deeper, eventually this will result in a broken string. Over Stretching – this happens when you miss-hit the shuttle, especially towards the top of the racket head. The additional pressure from hitting high on the frame presses causes the string to stretch in an area where the cross strings have finished. Without this protection the string will over stretch and break. Split grommet – grommets should be inspected by all stringers and changed accordingly. The grommet protects the string from touching the holes in the frame which are sharp. A split grommet can result in a string resting against the frame and then it is only a matter of time before a miss-hit will create over stretch and the string is sliced. Wear and tear – very similar to notching. The string is basically worn out as the protective jacket has worn thin or is non-existent. It’s only a matter of time before the string will then break. Temperature – This is often overlooked and tends to be more frequent in cold, winter conditions. Moving your racket from a warm house into a cold car and perhaps into a cold environment can make the strings a touch more brittle. 2 Knots or 4 Knots? Some manufacturers provide guidelines in terms of whether a racket should be strung with 1 piece of string or 2. Some stringers also have a personal preference (I prefer 2 pieces) and this will determine 2 knots or 4. In all, it doesn’t really matter which method is used – neither is ‘better’ than the other. 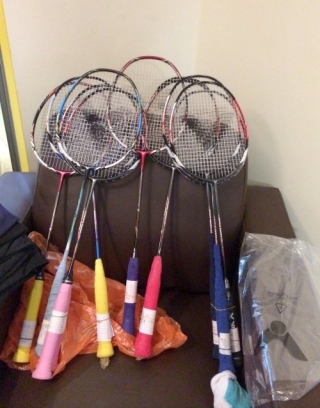 I hope this tour of badminton racket strings, tensions etc has given you a lot more information. Please feel free to ask questions. I also offer a restringing service for those local enough to me in Appleton Cheshire (WA4), please visit my dedicated page for more details.